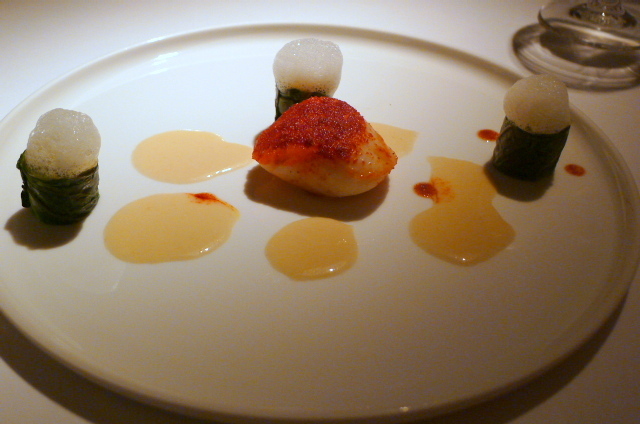 My previous visit to the one Michelin starred The Greenhouse restaurant was in November 2011 for the glorious Laurent Perrier champagne tasting menu cooked by Chef Antonin Bonnet. Bonnet has since left The Greenhouse to pursue other ventures and was replaced by French born Arnaud Bignon as Executive Chef in March last year. Bignon comes from a wealth of Michelin experience. Prior to his arrival at The Greenhouse he headed up the kitchen at Spondi, a two-star Michelin restaurant in Athens, and previous to that, he was Eric Frechon’s sous chef at the three Michelin starred The Bristol in Paris. Before dinner we sat in the bar area for drinks (the lychee martini was blindingly good) and canapés which included a deconstructed chicken Caesar salad, a soft mushroom meringue and minced prawns with spices and peanuts. The Caesar salad was a spherified drop of lettuce jelly containing a liquid centre and topped with Parmesan, a squid ink crisp bread and an anchovy. This was reminiscent of the spherified Greek salad canapé that Bignon served at Spondi, a dining experience that I am able to share with you in this blog post. Cleverly done, it exploded in your mouth with the flavours of a chicken Caesar salad to create an electrifying effect. The soft mushroom meringue was fabulous for it teased with a gentle earthy mushroom flavour and was also light and airy in texture. The prawns were pleasant from the spicing and the nuttiness of the peanuts. To the dining room we headed, a space that epitomises refinement and tranquillity. Decorated in muted tones, the restaurant is very formal and channels a quiet restraint. We elected to have the tasting menu with the restaurant kindly permitting us to make certain substitutions from the à la carte. To start, was an amuse bouche of avocado with a lemongrass emulsion and an apple and lime radish garnish that was wonderfully smooth from the creamed avocado. 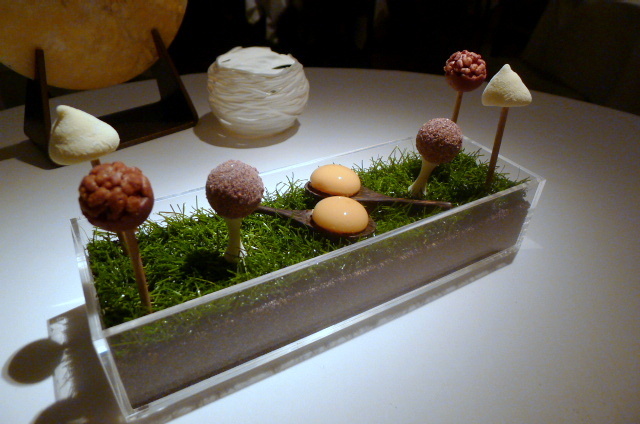 The lemongrass added a zingy touch to the amuse bouche and made this a refreshing start to the meal. Breads included Parmesan, sunflower and baguettes, all of which were fantastic. They had been made to the highest order with the crusts being hard, and the centres being soft and springy. 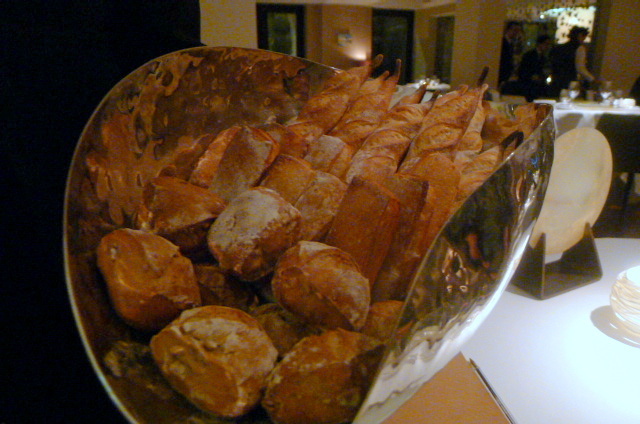 Particularly delicious was the Parmesan bread with its nutty cheesy flavour. 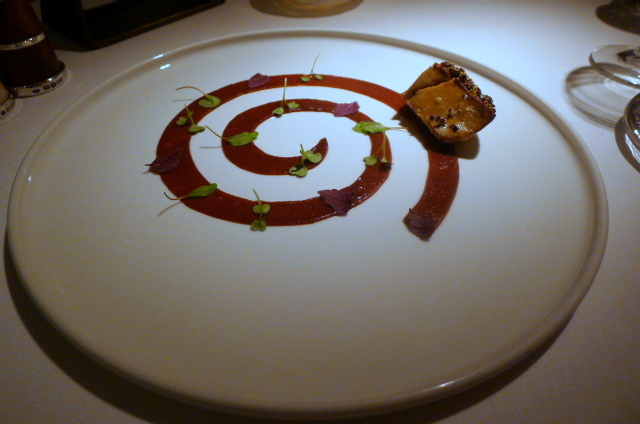 Our first course was a pan-fried foie gras that was beautifully decadent with a firm, yet soft texture. Interestingly, it had been topped with a sprinkling of fennel pollen and cocoa nibs for added contrast and aroma. A prune sauce worked well with it and was well judged for sweetness. The Greenhouse has the largest wine list in the UK and has won the Wine Spectator Grand Award every year since 2005. So it seemed best that the choice of wines be left to the sommelier. This course was paired with Floc de Gascogne Rose, Domaine Chiroulet NV, France, that had a lovely red fruit aroma that worked well with the foie gras. For the second course, a Highland scallop coated with tandoori spices was beautifully cooked, with the spicing adding fragrance and an elegant, yet piquant dimension to the scallop. Accompaniments of rolled January King cabbage finished with ginger and lemongrass was wonderfully delicate in flavour. 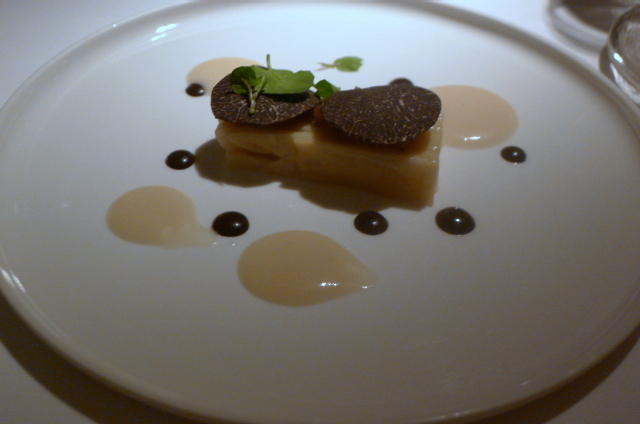 As my friend doesn’t eat scallops, we were presented with an alternative second course of millefeuille of celery, parsnip and Jerusalem artichoke topped with slivers of black truffle. The vegetables were perfectly cooked and the flavours merged beautifully together. 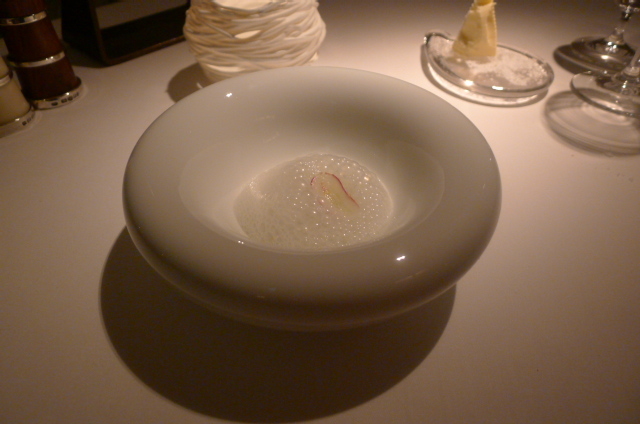 This dish was delicate, refined and elegant. Both the scallops and millefeuille were paired with Viognier, Le Pied de Samson, G. Vernay, 2011, Rhone, France. 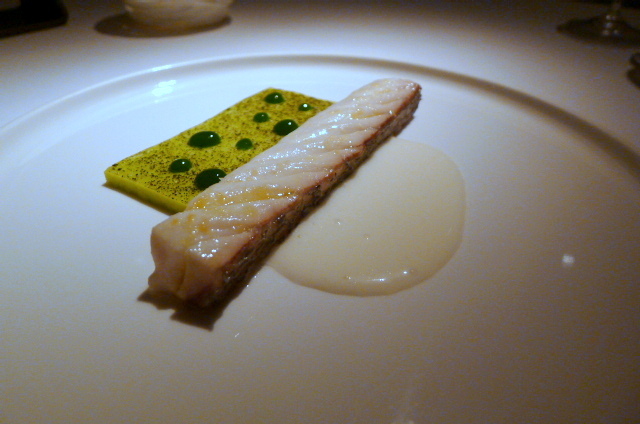 Line-caught sea bass was moist and soft on the palate. Alongside the fish was a creamy polenta topped with nori and droplets of chlorophyll, an interesting and unique composition that was well balanced in its flavours. A lovely yuzu sauce provided hints of acidity to this dish. The red fruit flavours of a glass of Syrah La Mirbaudie, G. Vernay, 2011, Rhone, France was also an interesting pairing for the fish. Scottish venison cooked medium rare was beautifully succulent and tender. It boasted of a great gamey flavour, which was further accentuated by the additional of a Tasmanian pepper sauce that added a kick to the meat. Salsify coated with gingerbread and roasted pears were delicately prepared and tasty. 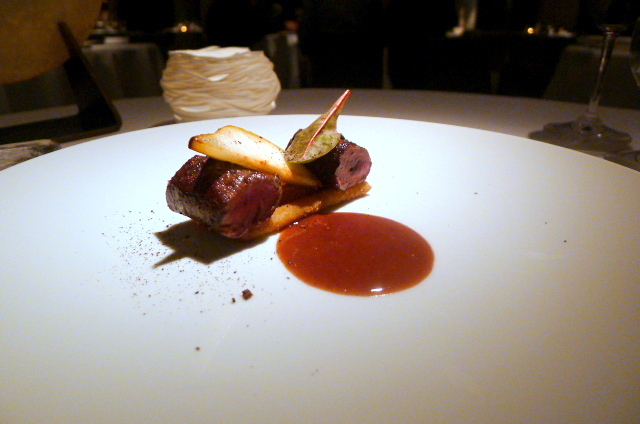 An Il Bruciato, Guado al Tasso, 2010, Tuscany, Italy, with its blackcurrant and liquorice flavours paired magically with the venison. 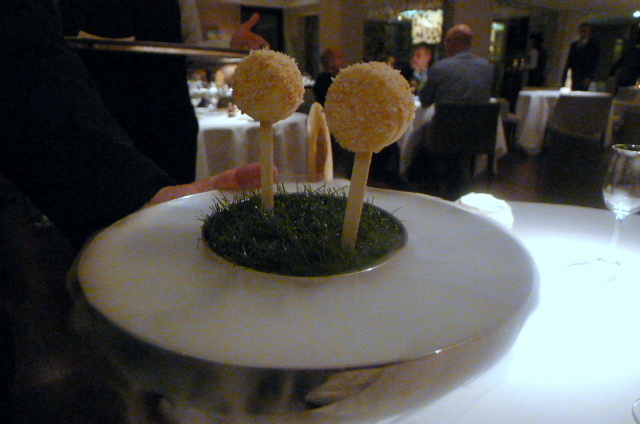 The pre-dessert was a Pina Colada lollipop coated with coconut and white chocolate. The pina colada flavour tasted like sunshine on a stick, although it was almost a touch too cold to the bite. The coconut coating had been gently roasted and was absolutely amazing. 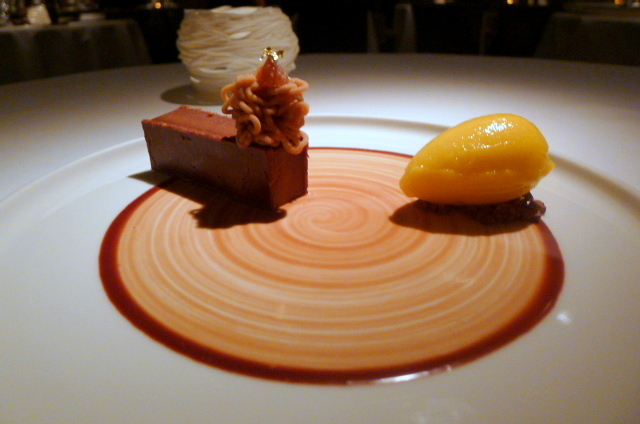 The dessert was a milk chocolate mousse on a hazelnut biscuit and topped with some piped chestnut cream. A clementine sorbet provided citrusy overtones and acidity to this pleasant dessert. This was paired with Vent d’Hiver, Domaine Chiroulet, 2010, France. The petit fours were engagingly presented as a ‘Green Box’ containing rice crispies with milk chocolate and coconut that was pleasant, a marshmallow with lemon and mint that was super zingy, and a tasty chocolate bonbon. In the spoon was an apple compote with crumble that was ok.
Everything about The Greenhouse sings of refinement, from the extremely polished, if a little stiff service, to the décor, to the food. Bignon’s food is slick, poised and composed. There is a minimalistic approach to his cooking, with the focus of each dish being the quality of individual ingredients. You could hardly fault a moment of this extremely fine haute cuisine experience. 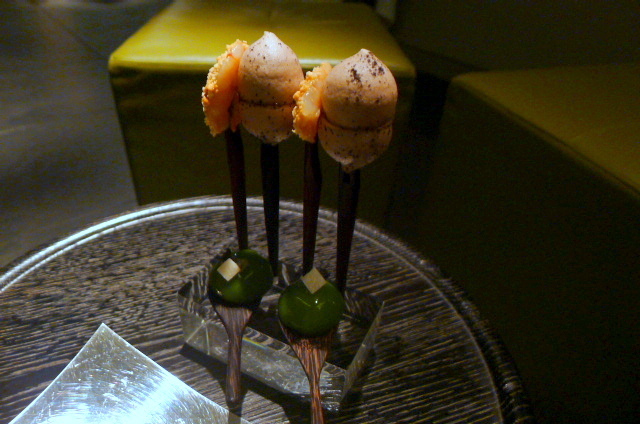 If an ultra all-round fine dining experience is what you are looking for, then The Greenhouse will certainly deliver.